A joint post by Dr. Zina Nimeh, Tamara A. Kool, Francesco Iacoella, and Alexander Hunns. In light of the World Humanitarian Day last Sunday, August 19, this post argues for the need to revisit humanitarian aid and place it alongside social protection. Recognising that over 140 million people relied on humanitarian aid across 37 countries in 2017, there is an urgent need to take up the discussion and look towards the delivery mechanisms of social protection that allow for more long-term development. Having discussed the moral responsibility of social protection, we now turn our attention to the critical topic of bridging the development-humanitarian divide. Uganda is one of the countries to look out for, as its refugee policy is one of the most advanced and open worldwide. The country allows refugees to own land and start businesses within the country and are therefore entitled to benefit from the national social protection scheme. It recognises refugees as actors of change in charge of their own destiny! 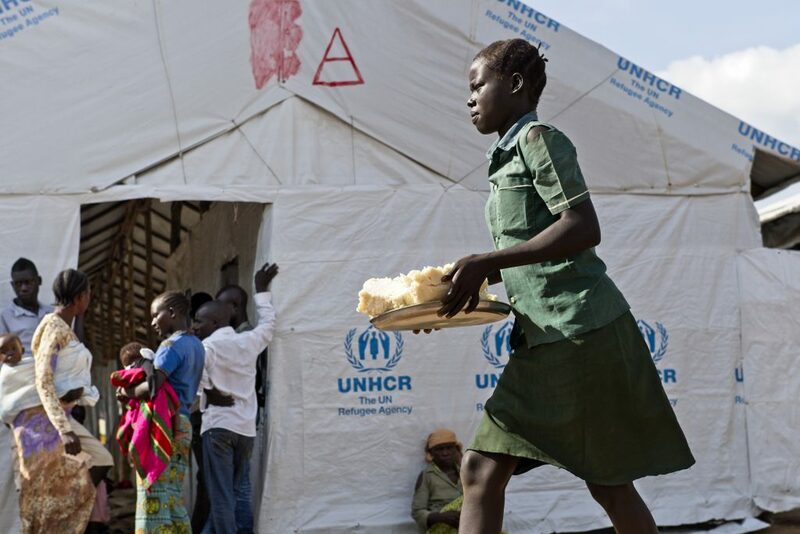 Not only do they seek to enhance the active ability of refugees to shape their future, the government of Uganda and UNHCR strive to reduce poverty and mitigate risk among both vulnerable refugees and their host communities. By incorporating a larger involvement of local leadership, host communities, and refugees in the decisional process over matters of inclusion, labour distribution, and poverty, its programme has the potential to move from a humanitarian approach to a developmental one. The agenda of the May 2016 World Humanitarian Summit revolved around consolidating efforts of building national social protection systems alongside those of the humanitarian community. The joint statement by the Social Protection Inter-Agency Coordination Board (SPIAC-B) explicitly asks how Social Protection systems can support an enhanced humanitarian system to work towards the “no one is left behind goal” in the 2030 agenda. To accelerate the linkages between social protection in its developmental nature and humanitarian activities, unequivocal actions need to be taken; including government commitments, financial resource management, and coordinated efforts among the actors. However, the challenge lies in figuring out how to foster cooperation to generate sustainable responses which not only temporarily aid people affected by crisis, but that also include long-term livelihood opportunities for them. This is especially true for the so-called chronic humanitarian caseloads, where households in a protracted refugee situation have been on the end of receiving social protection in the form of regular cash-based transfers and safety net provisions. Recent research on the impacts of cash-based transfers as humanitarian relief, argues that while effects of cash-based transfers on household food security and nutrition are at least comparable to the effects of food aid, transfers may have a larger impact on refugees’ savings and asset ownership. Examples of successful cash-based transfer projects are the ESSN in Turkey for Syrian refugees, and the Malian experience with emergency cash-transfers for food insecure households. Besides cash-based transfers, international organisations have been providing the forcibly displaced with other forms of social protection, consisting of in-kind, shelter, and health care and education (both within and outside camps). The UNHCR, WFP, NRC, and IRC are just a few of those involved in providing assistance to refugees. These examples show how social protection through a variety of instruments and delivery mechanism can be a rather formidable policy instrument which has a big potential of enhancing the resilience of refugee groups. International agencies commit vast resources to providing health care, education, and in-kind to individuals in displacement. The use of social protection in the form of cash-based transfers in humanitarian protection is growing, and there are indicators of progress, albeit slow, for the inclusion of displaced people in national social protection systems. UNHCR and the Ethiopian government, in the 2018 national refugee response plan, proclaim their dedication to “facilitate local integration in instances of protracted displacement; […] and provide access to vital events documentation to facilitate increased access to basic and essential social services”. However, the general focus on coping mechanisms alone remains present, even though protracted refugee situations are not quickly solved, and many stretch into decades with no clear end in sight, potentially resulting into the generation of negative cycles of deprivations along multiple generations. To avoid reliance on basic needs provision, we need to build on the agency of refugees that comes with ensuring a life in dignity by providing access to health, education and the labour market whether in- or outside camps. Therefore, a comprehensive multi-actor framework for a humanitarian transformative social protection is needed to guide aid programmes to ensure a sustainable livelihood for those displaced. This framework would provide a basic structure underlying the overall process of moving humanitarian aid into social protection systems, especially when protracted refugees are concerned. The role of social protection in bridging both the so-called “humanitarian- development” divide and the dilemma of meeting long-term needs with short-term humanitarian funding cannot be understated. The key feature of social protection systems and instruments is the intended provision of regular and predictable transfers that households can rely on and benefit from; thus, providing the needed foundation for long-term livelihood development. In its design, the framework should not only build on best practices but, above all, should go beyond the mere provision of aid by aligning social protection provision to refugees alongside the one received by host communities. During the Humanitarian World Summit, the SPIAC-B has called for “an incremental transition of ‘chronic’ humanitarian caseloads of affected populations into social protection programs and systems, where appropriate.” With over 140 million displaced, the urgency for improving the coherence between humanitarian assistance and development has never been more germane. Now is the time to rethink humanitarian aid! Linking sustainable social protection systems and international assistance is a step towards translating agenda into practical realities, a step to building a long-term movement that enables people’s agency and ultimately to help restore hope, dignity and a vision for the future.